Chief Craig Meidl (top) and Ombudsman Bart Logue (right) are working to reduce the department's uses of force. The use of force is an unavoidable reality of police work. People will resist getting cuffed, they will run from the cops and some will square off. Those incidents have the potential to result in serious injury or death to officers and citizens. Yet, there is no comprehensive and consistent national database on how, when and against whom police officers use force. The gap in information cripples any useful discussion of reform, researchers and law enforcement officials agree. In 2017, Spokane Police officers shot more people than they have in two decades, and nonfatal uses of force increased slightly from 2016, according to Spokane's Office of Police Ombudsman annual report. Uses of force, though, have generally trended downward since 2013, according to a 2016 SPD report. 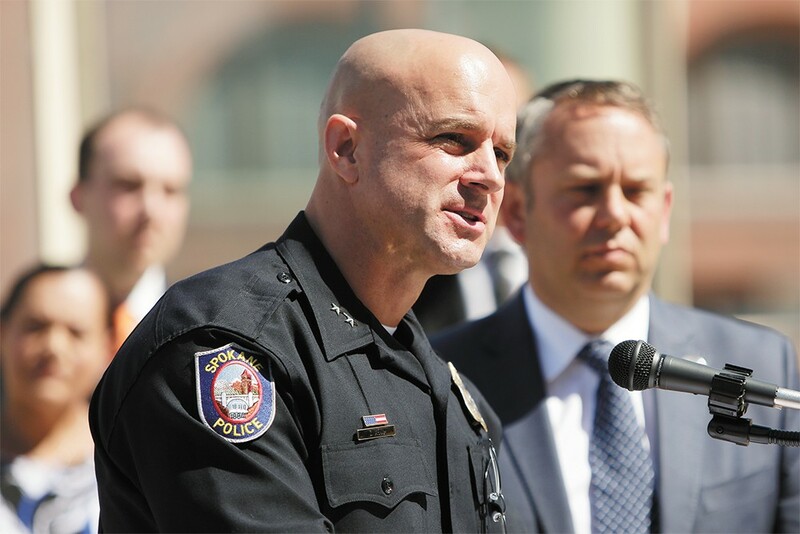 Several months ago, the police ombudsman Bart Logue began talks with SPD Chief Craig Meidl about revising the department's use-of-force policy. Changes would emphasize the sanctity of life, de-escalation and the use of time, distance and cover to reduce uses of force, Logue says. Those discussions are ongoing. Now, Logue is also pushing for a tracking and analysis system. Spokane Police Ombudsman Bart Logue. The system is developed by the Bainbridge Island-based company Police Strategies LLC and is used by several other agencies throughout the state. It combs through police records to give a more complete picture of use of force in Spokane. The system can identify trends and patterns, such as which officers use force most frequently, how they're using it and which citizens are most often subjected to it. The data is published online as an interactive dashboard. Meidl says he's supportive of efforts toward more transparency though he's reserving full support until he gets a better understanding of "the degree of transparency this provides." For Logue, the system will allow the city to think about police use of force on a deeper level than ever before. "There's more to use of force than just numbers," Logue says. "With all these variables you can dig down into, then maybe you can find something to do differently." Outrage over police use of force grabbed national headlines starting in 2014 after the deaths of unarmed black men, such as Michael Brown, Eric Garner, Walter Scott and Freddie Gray. As calls for reform intensified, one crucial point emerged: No comprehensive database of fatal police encounters exists, much less an accounting of nonfatal uses of force. The FBI's best estimate of "justifiable homicides" by police hovered around 400 per year. Since then, news outlets and other independent organizations have tracked uses of deadly force. Those efforts show that police in America shoot and kill approximately 1,000 people per year. In 2015 and '16, federal officials announced plans to collect use-of-force data, though the timeline for when those efforts could begin is unclear, the Wall Street Journal recently reported. Without an act of Congress, such programs would rely on local and state law enforcement agencies voluntarily sharing their data. Meanwhile, Bob Scales, CEO of Police Strategies, has been working to fill the gap with the data analysis system city officials are considering for Spokane. "The policies and training [on use of force] really aren't evidence based because there's no data to support them," Scales says. "The aim is to get to the most effective policies and training. You can't really do that until you have the data." So far, 32 police departments, most from Washington state, have signed on with Scales' company. The program requires each department to submit several years' worth of data on uses of force, typically in the form of reports written by officers. Spokane Police already posts use-of-force reports on its website and has published annual use-of-force reviews since at least 2014. Analysts for Scales' company code each report according to the use-of-force standard set by the U.S. Supreme Court. One function of the database is to identify any officers who are a high risk for excessive or inappropriate uses of force, Scales says. Currently, SPD's system for flagging officers with potential use-of-force issues is based only on frequency. If an officer uses force four times in a 12 month period, SPD's Internal Affairs receives an alert, which could result in more training for the officer. Under Scales' system, the alarm would sound for a number of other reasons including potential racial bias or excessive force. "Early warning systems are trying to catch officers engaging in serious use of force that are unjust, and the problem is they're based on frequency," Scales says. "What we've found is that officers that use force more frequently tend to use force more appropriately, so you're not flagging your worst officers, you're flagging the best." Another function, Scales says, is the ability to evaluate whether changes or updates to training and policy are effective — a perk Logue is particularly excited about as he and Meidl work to update SPD's policies. "As Chief Meidl puts more emphasis on de-escalation in his policy changes, we'll be able to compare whether those changes had any impact," Logue says. Thus far, the five-member police ombudsman commission has thrown its support behind the data-analysis system in a letter to Meidl. Some City Council members are supportive as well. "They're taking [the data] and reading and analyzing it in a way that I've never seen," says City Council President Ben Stuckart, who is pushing for the $35,000 to begin analyzing the data. "It's a good tool internally for everybody to see what's going on, and hopefully it will also be available and easy to use for the public." For Stuckart, the data-analysis system could be a step toward satisfying a recommendation by Eastern Washington University professor Ed Byrnes, who last year released a study showing some racial disproportionality in SPD's use of force. 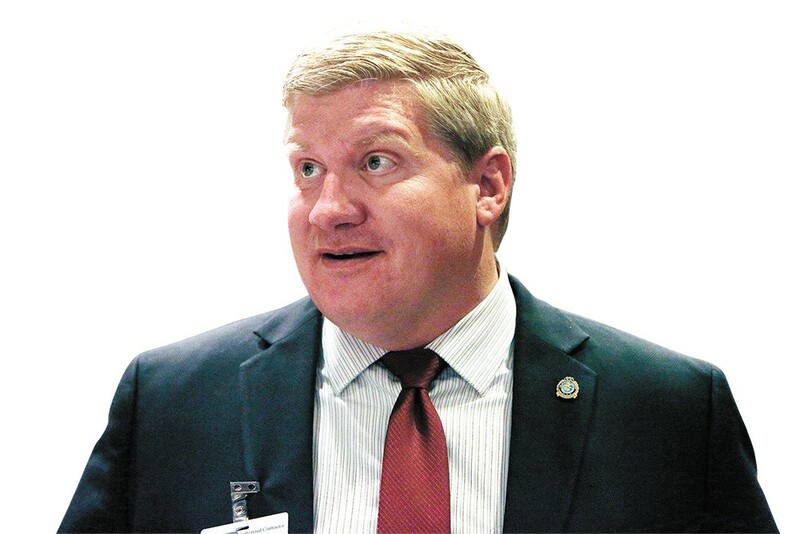 Byrnes recommended the city form a commission to address the disproportionalities in use of force and police-initiated contacts, but that has yet to happen. "It's the council's fault. We've dropped the ball since that report came out," Stuckart says. "We never jumped from there. We need a working group, as called for in the report, and we've got see why there are racial inequities in the use of force." It's unclear whether the Spokane Police Guild will support the new analysis system. Guild President Sgt. John Griffin did not respond to a message seeking comment. Logue, however, acknowledges that a potential pitfall, as with any data analysis, is that the circumstances of each individual incident could be lost in the numbers. The original print version of this article was headlined "Driving Force"